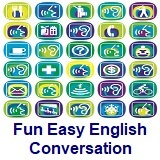 ﻿ Fun Easy English - new classroom free online classes english language lessons speaking listening writing reading april 11. 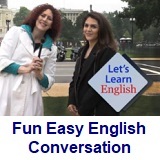 Today in the Fun Easy English classroom you are going to learn the correct way to write the English alphabet letter H in manuscript and cursive. Writing the English alphabet letter H correctly in manuscript and cursive. 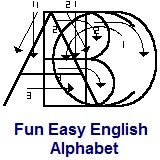 This letter is really easy to write in manuscript and is used quite often throughout the English language. David: Did you say you’re going to take a vacation next month? Ruth: Yes, my family and I are going to New York for a week. We want to visit the museums and see some plays. David: I envy you. I haven’t had a vacation for a long time. I wish I could get away for a while. Ruth: You can take a vacation sometime soon, can’t you? David: No, there’s too much work to do. Maybe next year, though. 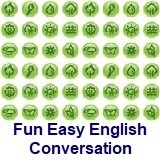 This could also be past tense: Did you say you were going to…? However, the present form (you’re) seems more natural. 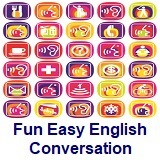 Notice that this going to is the verb go followed by the preposition to. The going to in the line above is the future marker, which is normally said with weak stress, as here. Note the required past tense (could) after wish. The rising intonation indicates that this is a veritable question, requiring an answer. Other examples of this pattern: There’s too much equipment to carry. There are too many papers to correct. There are too many people to see. There’s not enough food to eat. There isn’t enough work to do. There aren’t enough courses to take.